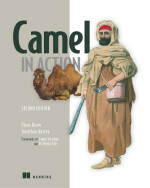 It's just by coincidence that both the Camel in Action and ActiveMQ in Action books are entering the production phase. This means the material for the chapters have been handed over for production. If you are in the lookup to buy either or both books then stop by the fusesource site to find the 40% discount code you can use when ordering from the Manning web store. If you want to know more about transactions with Camel then fusesource also have a free guide on this matter, which you can find here. Is there a way of doing remote tailing of log files using a camel component? I have looked the stream:file option but it seems to only tail locally. You can use the java.io.File or an URL so if you can access the file over an URL then you can do that. And using java.io.File you can maybe mount the local file system to a remote share. Ah, okay, will use the mailing list in the future. Thank you for your feedback. Yeah keep an eye on Manning tweets / newsletter as they often post discount codes. Its not unusual with a 20-40% discount for either Camel in Action or ActiveMQ in Action or both.